The updated site will emphasize out-of-pocket cost estimates. Plan network and formulary information tools are still in the works. (Bloomberg) — The Obama administration says it is working to make it easier for people to compare health plans and sign up for coverage on the U.S.-run website created under the Patient Protection and Affordable Care Act (PPACA). New features on HealthCare.gov, the PPACA public exchange enrollment system set up by the U.S. Department of Health and Human Services (HHS), will help people to see how much insurance coverage will cost, once subsidies are included, and what their other medical-care expenses are likely to be. Enrollment for 2016 plans starts Nov. 1 and is set to run until Jan. 31,2016. HealthCare.gov — which is used by 38 states— will let consumers preview plans starting Sunday. About 11.7 million people picked policies last year through HealthCare.gov and state-run exchange websites. 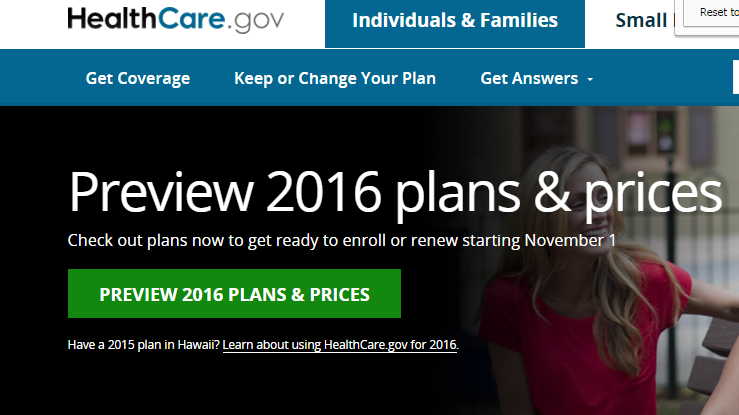 The HealthCare.gov system ran mostly smoothly in last year’s sign-up period, a big change from 2013, when the website crashed on its opening day in a major setback for the administration’s signature domestic policy achievement. Though the site has improved, critics said last year it still had too little information to help people make informed choices. The Obama administration has set a goal of covering 10 million people by the end of next year, up less than a million from 2015’s year-end goal of 9.1 million. About 6.3 million were covered at the end of 2014. More people pick policies than end up paying premiums, and some people drop their PPACA policies throughout the year. The government has said that affordability is a major barrier to getting coverage for people who remain uninsured. HHS Secretary Sylvia Mathews Burwell has said those who are still without coverage tend to be younger and poorer, and are often confused or unaware of subsidies. The new website estimates what individuals’ upfront payments and out-of-pocket costs are likely to be in different plans. It asks customers to select whether their health care use is likely to be low, medium or high, in order to display what their spending on doctor visits and drugs is likely to be. It also highlights additional subsidies that may be available to some low-income people in mid-level silver plans. CMS is also working on tools to help individuals figure out whether health plans cover particular doctors or medicines. The system relies on data from health plans, and the agency is still working to validate all of the information. CMS plans to release those tools in a trial, or beta, form this year, once all the information is ready.